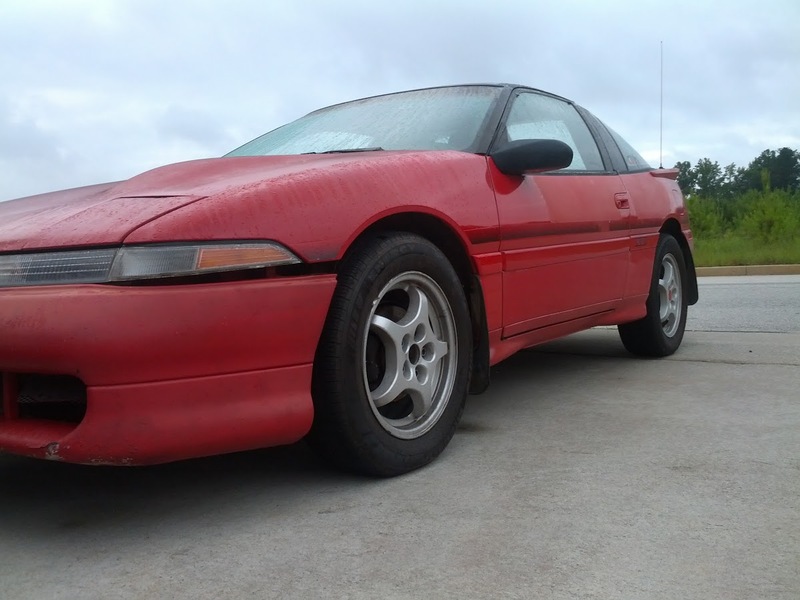 The GSX spent a long 2 weeks at the mechanic. It turns out the oil leak was due to the cam shaft seals that I never installed...woops. The oil drip was from a hole in the turbo oil drain line. Both of these were fixed in pretty short order, leaving a week to troubleshoot the reason behind not being able to get into 2nd gear. Notice how its not in my garage! 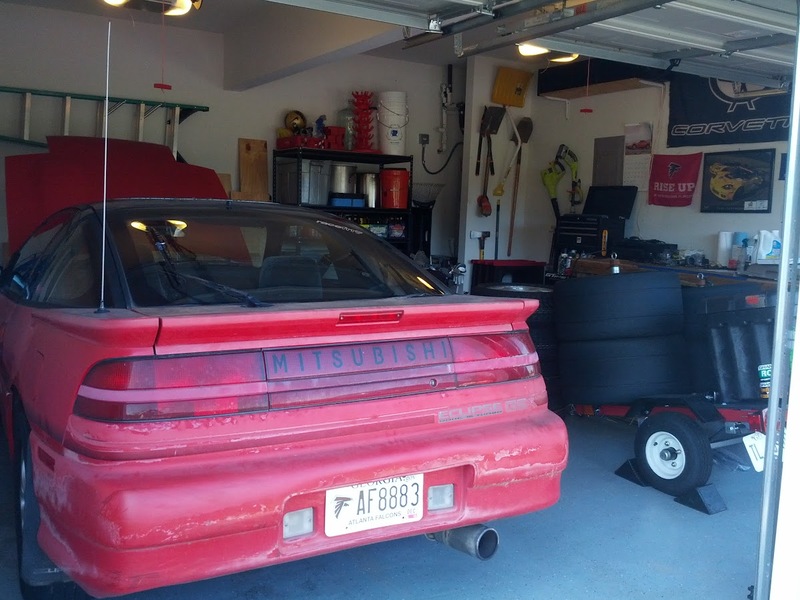 Read on to follow the final week of the Eclipse build. On a lift, it was possible to put the transmission into 2nd by moving the linkages on the transmission case. This implied the problem was upstream from that point. 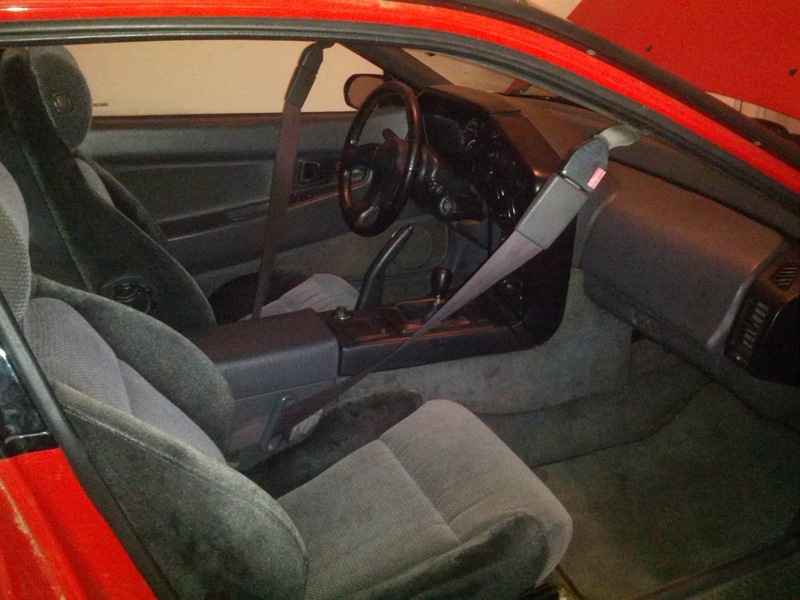 One of the many quirks of the 1990 dsm's (Diamond Star Motors - a joint Mitsubishi and Chrysler venture including the Eclipse, Talon, and Laser) is that their shift mechanism from the knob all the way to the transmission are unique to that model year. Sure enough, there were 1991+ shift cables installed. It took a couple of days to get new cables in (there are now only 14 sets left in the US), but they installed quickly. I picked up the car on Friday afternoon - 40 hours to race time. I don't have any pictures of its time at the mechanic and we didn't document the hectic hours after picking it up, so I'm going to provide unrelated, but interesting pics instead. This is my garage where all the work happens. I can roll the tire trailer out of the way when I need more space. The car still wouldn't go into 2nd gear - the problem must be worse that I thought. I can put it in 2nd at the transmission linkage and just start the car in 2nd and never leave for the race - the speeds should be about right for that. But first things first, the car overheated on the 2 mile drive home. 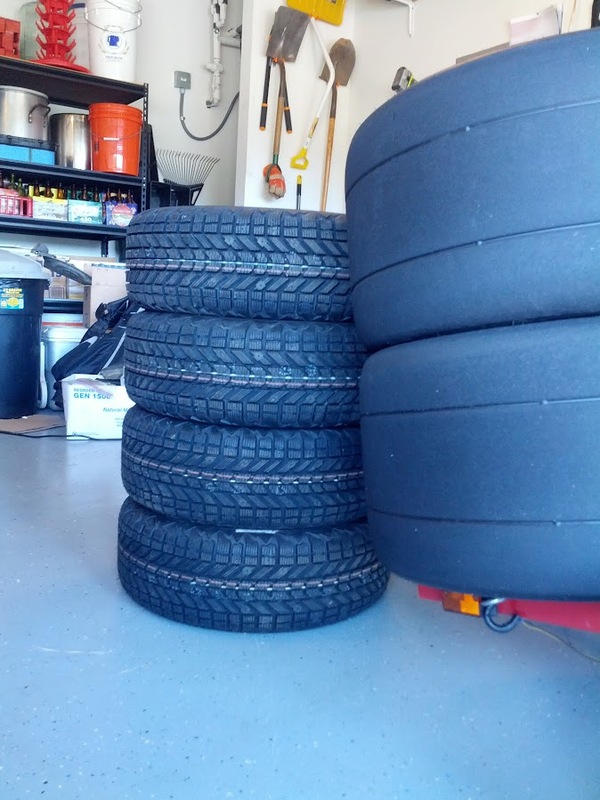 These are the GSX's rally tires (205R16) set next to the Z06's slicks (345R19). All 4 rally tires cost as much as 1 autocross R compound tire. Ish and I spent a solid hour flushing the cooling system and trying to get bubbles out. Finally, the car was able to go around the block at temp. Time for the first real test. I head to the empty streets at the back of my neighborhood to see what she can do. I was worried that the GSX would be boring compared with the Z06 and I would be left depressed and sad that I didn't have 500hp. This was unfounded. 1st gear pulls strong - this is going to be a worth wile project. I put it in 3rd and wait for the engine to get back to its power band (the shift from 1-3 is pretty rough). Finally, she pulls strong to 4000rpm, boost should start building now...and then I'm flung forward as all acceleration is lost. The car bucks and tries again, only to stop at 4000rpm. That's all she's got - just past halfway to redline. Then the temp gauge spiked. Something's wrong - back to the garage. 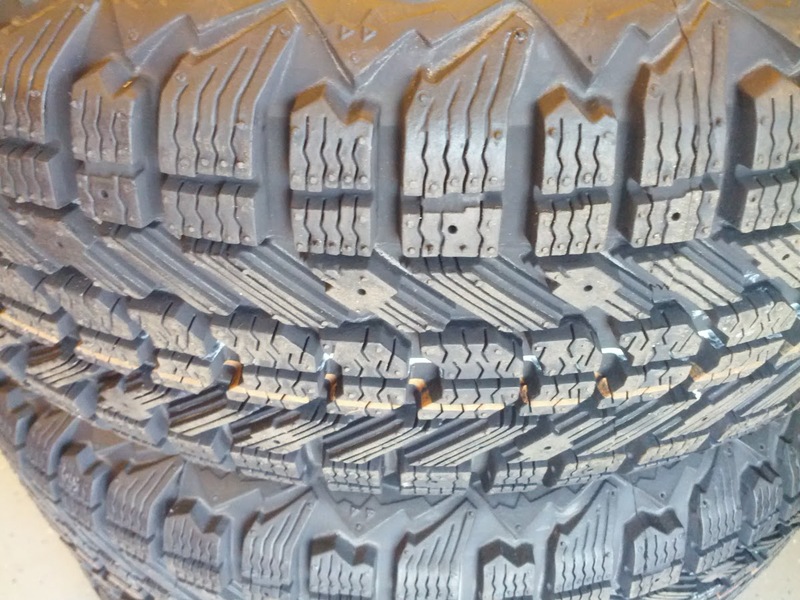 A close up of the Winterforce's tread pattern. The rubber is nice and soft; these things are really going to tear up some dirt. The overflow tank is empty, so we open the radiator cap and there's nothing but air visible. We fill it up, happy that we dislodged another air pocket and start looking for a reason that it won't pull power. After checking throttle travel, air line blockages, and topping off the fuel to dilute any bad fuel that may be left over, we decide to give it another try. This time we put it in 2nd to test my race plan. As I let the clutch out, there is a horrible grinding noise and the shifter pops out of gear - uh oh. One more try, and the same result. Second gear is going to be unusable - this is a serious problem for a rallycross event. Another trip around the block and the car still won't pull power and is running at the temp limit. A fuzzy photo of the interior. It's actually in really good condition. Especially for being 23 years old. 33 hours to race time and I'm faced with a decision. Tear apart the transmission, rebuild it and install it in one day, or take a punch in the gut and admit that this car won't be entering the rally. I don't even know if the transmission is repairable. Even if it is, the car still won't produce any power above 4000rpm...and it overheats. Knowing that it might come to this, Phil had offered to let me co-drive his WRX. I get out my phone and send Phil a text: "The Red Rocket will not be driving." Its not over; this car will go racing. It will go racing soon. I don't know where or exactly when, but I'm too close to let this one go. That's really nice sports car. I like its look and color very much.